The author Franz-Philippe Przybyl aka FPP has experienced the path from zero to hero to zero and back up again. He and also many people around him wondered how he found the energy to get back up and motivate himself even in adverse circumstances. He distilled his thoughts and identified the eight Essentials of Success. Mixed in the right way they can help you to identify the perfect and bespoke morning ritual for more energy, happiness and fulfillment in your life. 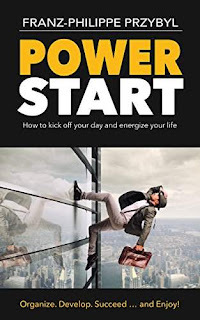 The book has already been endorsed by Jack Canfield (Co-creator Chicken Soup for the Soul Series), Brian Tracy (Author Maximum Achievement) and Marci Shimoff (Author Happy for No Reason). It has won the Silver Medal of the eLit Book Awards 2017 in the category self-help.